Sometimes we get dares and challenges posted on our NiliPOD Instagram account, so we save them up ready for a video. 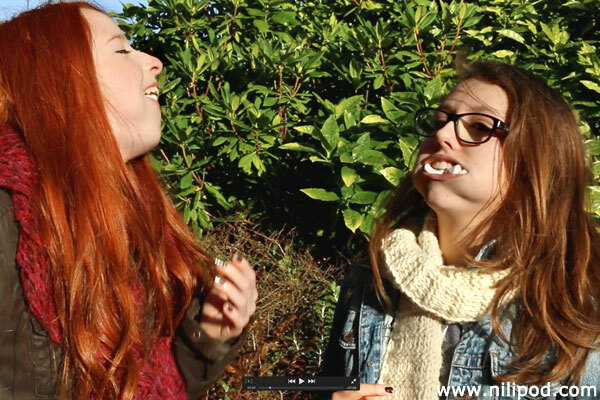 On this particular photo, we are playing Chubby Bunnies, which some people call Yummy Bunny or even Chubby Monkey. Anyway, it involves shoving lots of marshmallows into your mouth until you can't fit any more, and the person with the most marshmallows in their mouth wins the game. Simple rules for a very simple game. Apparently people seem to think that this game began way back in the 1950s, in the comic strip Peanuts with Charlie Brown, when Snoopy was stuffing his mouth with marshmallows. Although people are still playing this game all these years later, it is worth saying a serious word of warning, be careful that you don't choke. Don't ever play it on your own and make sure that a sensible adult is close by, to supervise. It's a good thing that marshmallows are so cheap, because it's such a waste of nice sweets!